If you are looking to recreate the Battles of the pacific Warlord Games have created some additional scenarios for you to use. More of these will be released later this year in the "Empire in flames" supplement book. Below is a copy of warlord Games' Iwo Jima Bunker assault scenario. Because these scenarios can be hard to find I have posted them here for you. For fighting during the Battle for Iwo Jima, we suggest the US forces, taken from the 1944-1945 Iwo Jima selector of the Armies of the US book, as the attacker, and the Japanese as the defending force, taken from the Iwo Jima 1945 selector of the Armies of Imperial Japan. In addition, the following two Special Rules apply. The US player receives one free regular Air Observer and one free regular Artillery Observer (both representing naval attaches) on top of their normal allowance. From turn 3 onwards, the Japanese player rolls a die at the beginning of every turn and looks up the result on the chart below, which potentially allows him to get some extra units. These units can Advance or Run onto the table from any point alongside either long edge of the table (‘on the flanks’ so to speak), like Reserves. Alternatively, these units can be deployed into one of the bunkers, as long as the bunker is not occupied by US troops – being deployed into one of the bunkers is the same as entering a building, except that it counts as receiving an Advance action. Note that no Order test is necessary for these new units to enter the battle, either on the flanks or into a bunker. If the player does not have suitable models to represent the models rolled, he can pick any of the lower results that he has models for. Your forces must smash through the enemy defence lines and capture all three enemy strongpoints. 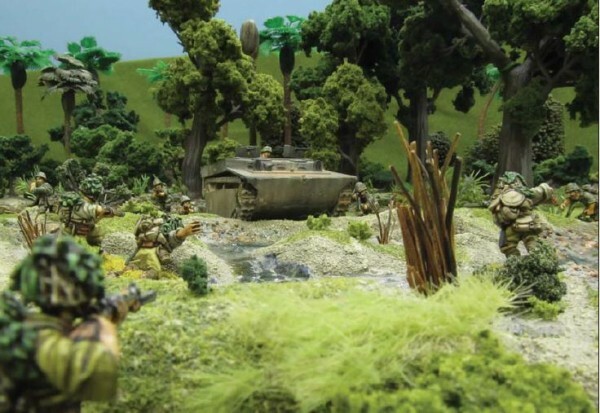 This scenario pitches a superior attacking force against a defender that, though outnumbered, is dug in into a well-prepared defence line consisting of pillboxes/bunkers and other obstacles and fortifications. First agree with your opponent who is going to be the attacker and the defender. The attacker picks a force to an agreed points total (e.g. 1,200pts) and the defender picks a force that is half that total (e.g. 600pts). In addition to his force, however, the defender receives three bunkers and nine ‘hard cover’ linear obstacles. 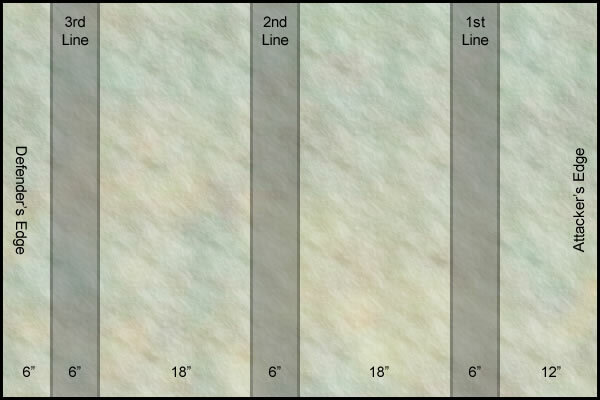 Each linear obstacle must be up to 6″ long and 1″ tall, and should provide hard cover (so use low walls, earth embankments, sandbags and the like). You can replace any number of ‘hard cover’ linear obstacles with ‘soft cover’ ones (barbed wire, hedges, picket fences, etc.) and if you do so, you get two ‘soft cover’ obstacles for each ‘hard cover’ one you surrender. However, if you replace too many obstacles in this way, you can alter the game balance pretty badly, so try to stick to nine pieces of hard cover as much as you can. Bunkers should be large enough to accommodate a single unit of infantry or artillery. The rules for bunkers are on page 104 of the Bolt Action rulebook. The game is played along the length of the table. Terrain: The defender sets up one of his bunkers and three linear obstacles in each of the areas highlighted in grey on the map – the first, second and third defence lines. 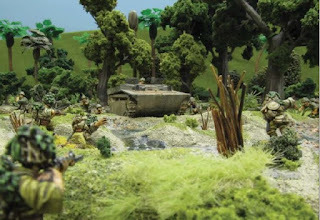 The rest of the table should have very little terrain, maybe only the occasional tree or area of scrub, but as it represents a prepared defence – anything likely to provide cover to an attacker would have been removed to leave a good field of fire to the troops in the bunkers and behind the fortifications. 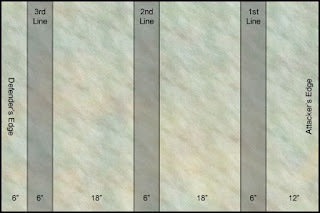 The last strip of table between the third defense line and the Defender’s edge of the table can include more terrain, like a small wood, or even some buildings, but once again, do not overdo it. It is important that the defender sets up the terrain cleverly, making sure that as much as possible the bunkers’ line of fire is as clear as possible and that the fortifications make life as difficult as possible for the advancing enemies. Keep in mind that the enemy is likely to take cover behind your defences as he captures them, and that firing over obstacles, unless your troops are leaning against them, will offer cover to the enemy infantry as well… so place your defences cunningly. Deployment: The defender then divides the number of units in his army by 3. The result is the number of units he must deploy within each defence line. Of course, unless the total number of units in your army is a multiple of three, you’ll end up with one or two spare units – these can be placed in any defence line or left in Reserve (they can even outflank!). For example, if you have seven units, you must place two in each defence line and you end up with a spare one, which you can add to any defence line or leave in reserve. Defending units can (and should!) use the hidden set-up rules (see Hidden Set-up on page 117 of the Bolt Action rulebook). The attacker’s units are not set-up on the table at the start of the game. The attacker must nominate half of his force (rounding up) to form his first wave. Any units not included in the first wave are left in reserve. Units in reserve cannot outflank in this scenario, and similarly units with special deployment rules, like snipers, observers and spotters, cannot use their special rules. The attacker must try to capture the three bunkers – the defender must try to stop him. To capture a bunker, the attacker needs to clear it of all enemies and enter it at some point during the game with one of his infantry units. If the defender moves an infantry unit back in, then the attacker must capture it again. The attacker rolls a die: on a 2+, a preparatory bombardment strikes the enemy positions (see Preparatory Bombardment page 118). On a result of 1, the barrage fails to appear, but you have your orders and the attack must go ahead as planned. The battle begins. During turn 1, the attacker must move his first wave onto the table. These units can enter the table from any point on the attacker’s table edge, and must be given either a run or advance order. Note that no order test is required to move units onto the table as part of the first wave, and remember that they cannot assault on the turn they enter the table. Keep a count of how many turns have elapsed as the game is played. At the end of turn 10, roll a die. On a result of 1, 2 or 3 the game ends, on a roll of 4, 5 or 6 play one further turn. At the end of the game, if the attacker has captured all three bunkers, he wins. If the attacker has captured two bunkers the game is a draw. If the attacker has captured one bunker (or none!) then the defender wins. All bunkers are held by the defender at the start of the game regardless of where his troops are positioned. If a bunker changes hands during the game then it remains under the control of that side until it is taken back. To capture a bunker there must be no enemy in it and you must move one of your infantry units into it. You might of course play this type of game on smaller or larger tables, in which case you should reduce/increase the number of terrain pieces in proportion with the size of the table. On much larger tables, you may even want to increase the number of bunkers and/or defence lines, but remember to adjust the number of turns played as well, otherwise you risk running out of time before you can even reach your objectives!